The city of Newport was built long before the automobile and begs to be walked to fully appreciate its historic nature. Take an hour and walk through the neighborhoods of Historic Hill or The Point. The Cliff Walk also offers visitors a 3-mile stretch of coastline walkway on the cliffs overlooking the Atlantic Ocean and Newport's mansions. Whatever your choice, walking is a much easier and more fulfilling way to take in Newport with its narrow streets and colonial charm. And if you really want to experience Newport, take to the air in a plane or helicopter at Newport State Airport for the views of a lifetime! 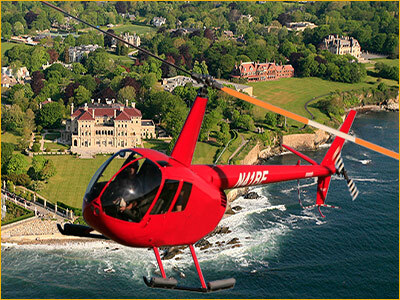 Experience Newport like you've never imagined, from the seat of a helicopter flying over the beaches, mansions and harbors throughout Aquidneck Island. A great way to explore Newport for the whole family! They also provide other area tours like Narragansett Bay, Bristol, lighthouse tours and more! Prices starting at just $75/pp! (minimum 2 passengers). A great experience you'll never forget. Also offering charter service and intro/demo flights! Guided walking tours of Historic Hill, the Point, Cliff Walk, and Newport's African-American and Religious heritage. Beginning at Memorial Boulevard and ending at Bailey's Beach at the end of Bellevue Avenue/Ocean Drive. Newport's most famous walk, and with good reason. Our favorite time of year to go is in mid to late fall, when the still-warm ocean breezes feel great on a chilly day. The first half is mainly paved with occasional rocks and steps and offers breathtaking unobstructed views of some of Newport's mansions. The brave can venture further onto rocks and dirt paths past more mansions like Doris Duke's Rough Point and end up at Ledge Road or Bailey's Beach. Feel transported back to colonial times as you explore neighborhoods brimming with history. Enjoy an evening lantern tour, a family-oriented history detective tour or a visit inside the historic Friends Meeting House.